If I’m off-duty I like to keep it casual. When seeking easy-to-wear, I want to be comfortable without sacrificing flare. My solution is to reach for my favorite Equipment button-ups. I love shopping the store on Melrose Place. If you are ever in Los Angeles, make sure you pay them a visit. I’m certain I own every version of the “adeline” shirt that they carry (just ask the girls at the shop! ), but this time I opted for a new style. 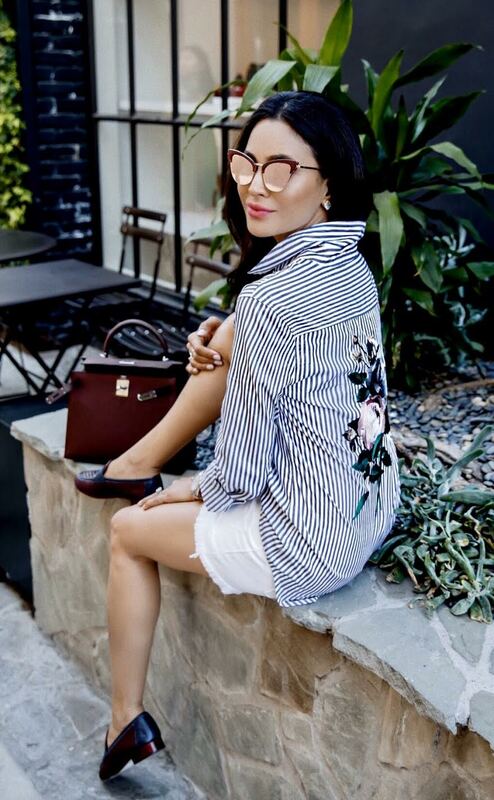 I am constantly wearing men’s shirts to get that relaxed, oversized fit, so I knew I found the perfect button up in this striped top. And can we talk about the stitched floral design on the back? Have I mentioned that lately I’m Falling for Florals? I like to wear my sleeves rolled up and a pair of loafers—no heels when I’m off the clock. (Let’s be real, even on the clock I’m in sneakers!) Sharing with you my current favorite off-duty style and a few other great not so basic button ups. The embroidery on the shirt makes it the statement piece. It’s serves both as a top and a standout accessory. Tucked into some white cut-offs, the outfit looks put together while still being completely effortless. It’s a perfect piece to add to your off-duty wardrobe. As for my shorts I can get away with wearing these white cut offs in LA during the Fall season. Found these reflective sunnies with a maroon frame by Le Specs . It’s the “Ashanti” sunglasses and it matches my handbag and loafers. I normally don’t like everything to match, but how could I resist these shades, just looked right when I threw them on! Here are a few other sunglasses that I’m currently loving below. What’s currently your off-duty style and does it involve a button down shirt? Leave a comment down below and share with me your style! I always LOVE reading your questions and comments! I’m kind of in love with your style! 💕 Love those sunnies!